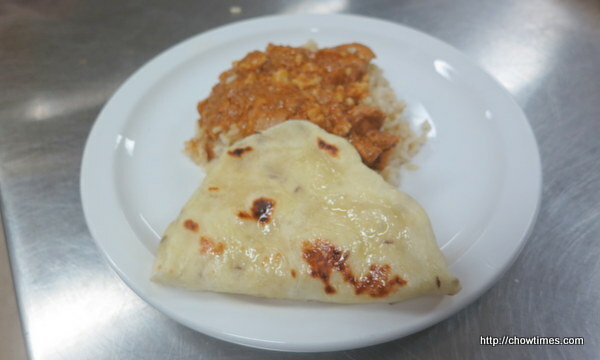 We made Indian Naan Bread to serve with the Butter Cashew Chicken at the South Arm Community Kitchen. 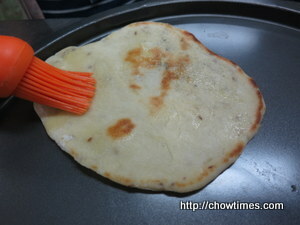 Our naan did not rise as much because we do not have enough time for the bread to proof in the session. 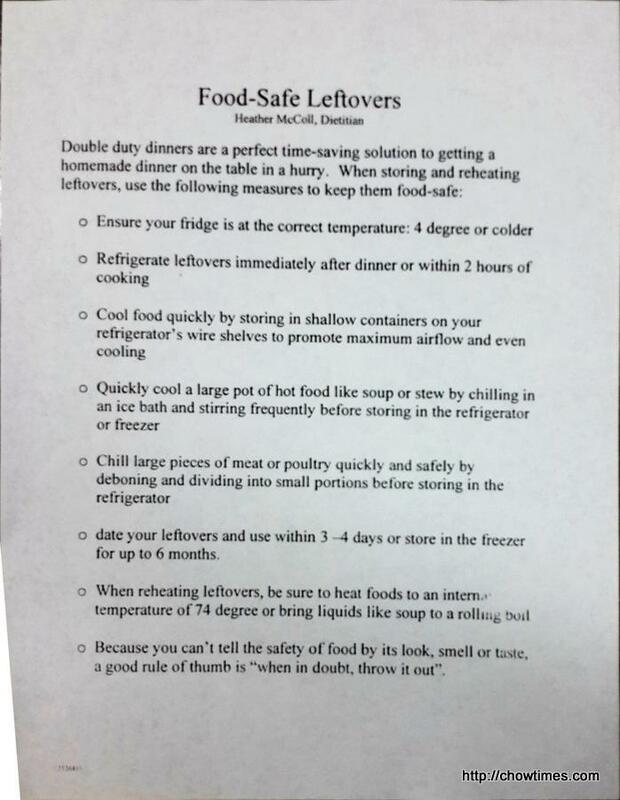 Minoo shared the above food safe tips at the kitchen. Dissolve the active dry yeast and 1 teaspoon of the sugar with 3/4 cup warm water (about 100F). Let it sit until frothy, about 10 minutes. 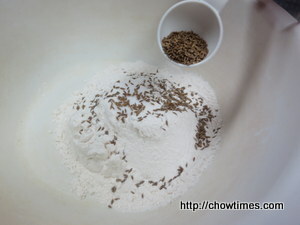 Meanwhile, in a large bowl, whisk together the remaining 2 teaspoons of sugar, flour, salt and cumin seeds (if using). Set aside. 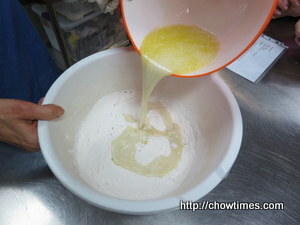 Once the yeast is frothy, add the yogurt and olive oil to it and whisk to combine. 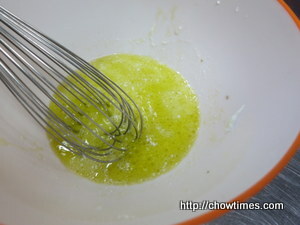 Pour the yogurt mixture into the dry ingredients and mix the dough together with a fork. 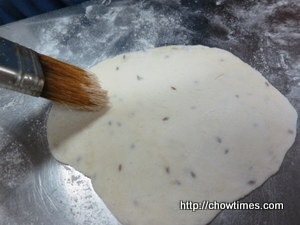 When the dough is about to come together, dust your hand with flour and knead gently into a soft, slightly sticky dough. As soon as it comes together, stop kneading. Lightly oil or spray a clean bowl (the bowl must be large enough to allow the dough to double in size) with non-stick cooking spray (we just used back the bowl that we prepare the yeast as there is olive oil in it already). 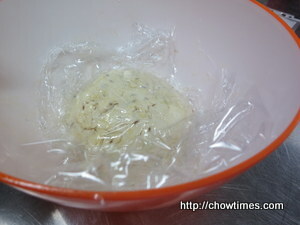 Transfer the dough to the prepared bowl and rub the top of the dough with some olive oil. Cover with plastic wrap or a damp kitchen towel. 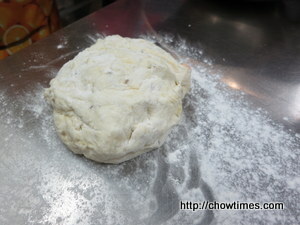 Let sit in a warm place for 1.5 to 3 hours, or until the dough double in size. The warmer the spot, the faster the dough will rise. 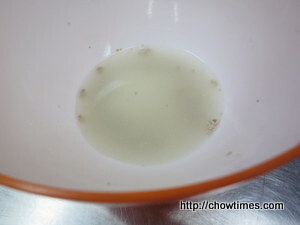 Fill a small bowl with about 1/2 cup flour. Dust a work surface with some of the flour and dump the dough on top. 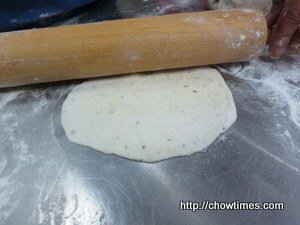 Sprinkle some of the flour on the top of the dough and on your hands. Shape the dough into a long rectangle and cut into 6 equal portions, dusting with more flour as necessary so the dough does’nt stick. 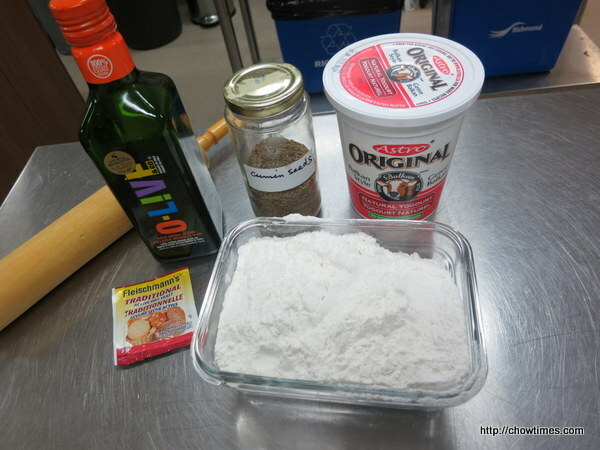 Roll each portion of dough in the bowl of flour to keep them from sticking. Warm a large cast iron or heavy non-stick pan over medium-high heat until very hot. Using a rolling pin, roll one of the dough balls into an oval shape about 1/8 inch thick (it should be about 9 inches x 4 inches). Pick up the dough and flip-flop it back and forth between your hands to release any excess flour or brush off excess flour with a pastry brush. Gently lay the dough in the dry, hot skillet and cook until the top is bursting with air bubbles and the bottom is golden and blackened in spots, in a few minutes. 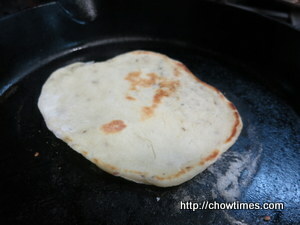 Flip the naan and cook about 1 to 2 minutes more until the bottom is lightly browned and blistered in spots. 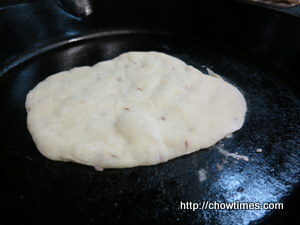 Remove the naan from the skillet and brush with melted butter or olive oil. Place the naan in a tea towel-lined dish to keep warm.